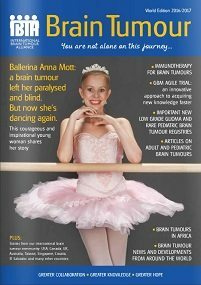 The IBTA’s Brain Tumour magazine is unique. 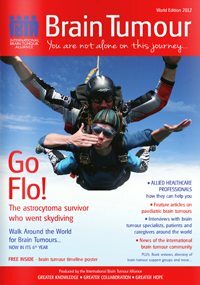 Published annually (approximately 13,000 copies) it is sent for free to recipients in 113 countries and widely distributed at international neuro-oncology and cancer conferences. 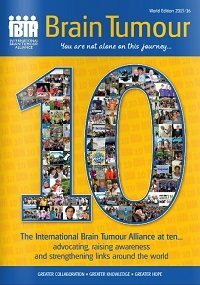 We include interviews with eminent neuro oncologists, neurosurgeons, researchers, specialist nurses and allied healthcare professionals from around the world; stories from brain tumour patients and carers; information on new approaches to treatment; news from our international brain tumour community; reports of activities held during the International Brain Tumour Awareness Week and the Walk Around the World for Brain Tumours and our global directory of brain tumour patient and carer support groups. 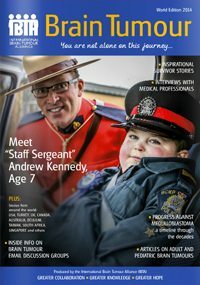 Our monthly e-News highlights items of interest to our international brain tumour community and is emailed to nearly 7,000 recipients. 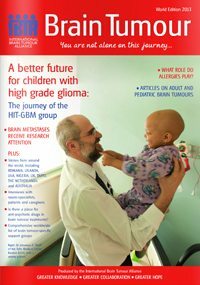 Read here about latest research and treatment developments, news about brain tumour patient organisations around the world and key forthcoming neuro oncology scientific and patient conferences. 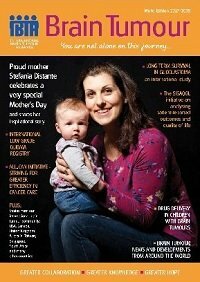 By clicking subscribe, you consent to the IBTA sending you the IBTA e-News and other important information and communications, concerning or relating to brain tumours and other rare cancers. We will not share your contact details with third parties. As per EU-wide GDPR regulations, we will hold your data for a maximum of three years, unless you ask us to remove it within that period. You are free to ask us to do this at any time. See our privacy statement here.